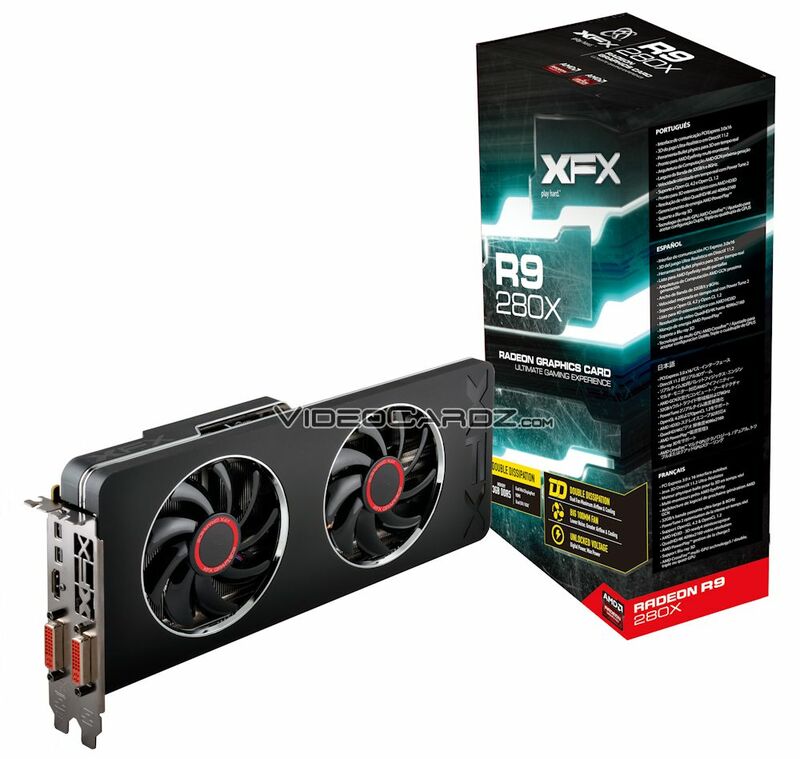 The entire XFX Radeon R9, Radeon R7 and Radeon R5 series graphic card lineup has been leaked by Videocardz. The lineup includes a total of 12 new GPU models featuring both the new and old Double Dissipation design and Passive cooling. The Radeon R9, Radeon R7 and Radeon R5 series would hit retail this week while reviews will go live tomorrow. There are several Radeon R9 and Radeon R7 series graphic cards which XFX has been working on and a few of them were pictured yesterday at an event held by AMD in Australia. Unfortunately, unlike the Sapphire lineup, no additional specs sheet was available so its hard to tell what clocks would the graphic cards will be running at. Starting off with the Radeon R9 280X which is based on the Tahiti XT die, featuring 2048 cores, 128 TMUs and 32 ROPs. 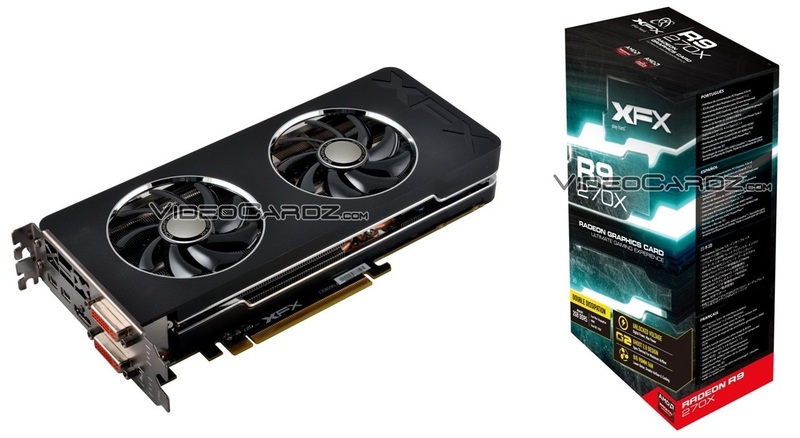 The Radeon R9 280X would feature a 3 GB GDDR5 memory operating across a 384-bit wide memory interface. The card would be clocked at 1000 MHz at base and 1050 MHz with GPU Boost while the memory would be clocked at 1500 MHz or 6 GHz effective clock speed. XFX has prepared the new Double Dissipation model if this card featuring an cool new shroud design, better and custom designed PCB along with faster clock speeds out of box. The model would retail at a price of around $309.99 US. The follow up is the Radeon R9 270X which is a Pitcairn rebrand codenamed Curacao XT with 1280 shaders, 80 TMUs, 32 ROPs, a 256-bit memory interface and 2 GB GDDR5 memory. Just like the Radeon R9 280X, XFX would release two models of the Radeon R9 270X – the Radeon R9 270X Ghost would come with Battlefield 4 but would feature the older Double Dissipation cooling design whereas the Radeon R9 270X Double Dissipation would come with the revised version of the Ghost 2.0 cooler but won’t feature the Battlefield 4 bundle. Both cards would hit the market at prices slightly higher than their MSRP of $199.99 US. The $139 Radeon R7 260X which is a Radeon HD 7790 rebrand featuring the Bonaire XTX chip with 896 Stream processors, 16 ROPs, 56 TMUs and a 2 GB GDDR5 memory running across a 128-bit wide memory interface. The core clock is maintained at 1050 MHz while memory operates at 1620 MHz. XFX would release two models of this card, one featuring a single fan design while the other would feature Dual fan Double Dissipation cooler. Lastly, is the $89 Oland Pro based Radeon R7 240 which is the entry level Volcanic Islands chip featuring 320 Shaders, 8 ROPs and 20 TMUs. The card is shipped with a Gigabyte of memory running across a 128-bit interface while clocks are maintained at 780 MHz for the core and 1150 MHz for the memory. Its bigger brother, the Radeon R7 250 which is based on the Oland XT GPU would feature 384 shaders, upto 2 GB GDDR5 memory along a 128-bit interface and faster clock speeds.